I took the risk of asking my children, who are in second grade and kindergarten, what kinds of things they remember my wife and I saying and doing while they’re in the back seat of the car as we travel from place to place. We do a decent amount of driving, between visiting friends in the next town, getting to airports, and driving between family members. Strapped in back there behind us in the car, my children do a combination of sleeping, reading, watching movies, and fighting (in ascending order of frequency). But I recently became curious: What do they observe and hear? What interactions and conversations with my wife are they picking up? Their answers could have been worse, although my daughter quickly mentioned two recent unpleasant circumstances. She remembers the not-so-calm conversation near Christmastime when we realized we had left IDs at home and would miss our flight, and she also mentioned “mommy throwing up in the bag” this summer. Doesn’t everyone enjoy traveling with a stomach bug? But the other thing they observed was that we “talk about people.” They didn’t really answer when I asked what that meant, but of course I’m sitting there trying to figure out, ‘Is that a good thing or a bad thing?’ Maybe they heard us talking about how much our friends mean to us or how we’re praying for certain people? Yeah, right; they probably heard us gossiping. Children must have such an interesting vantage point from that backseat. As we drive from here to there, the long winding road is up ahead, but right in the foreground are the adults in their lives and whatever we’re doing…or not doing. One of my consistent worries as a parent is what my children are going to remember about me when they grow up, and hoping they remember more good moments than bad. I’m a pastor, and my wife is a teacher. But our children don’t often see us in the setting of our jobs when we’re doing our best and on good behavior. They more often see us at the end of the day when we’re tired and grumpy with a depleted energy tank. As many parents and teachers will tell you, children absorb way more than we think they do. Of course, when we’re in the car, I’m well aware that my children are devoting a lot of their attention to the movie they’re watching or to annoying each other. Even so, think about it: car rides actually represent the most sustained amount of time children have to watch and listen to their parents in close proximity. What do they learn from watching and listening to me from the back seat? Do they hear understanding words, or impatience? Do they hear me saying things that build up, or too much “unwholesome talk” (Eph 4:29)? Do they observe me enjoying God’s creation, or desperately rushing to the next destination? Do they see me driving safely, or messing with my phone? I think about the different practices we associate with our faith: Prayer, worship attendance, ordinances and sacraments, and scripture reading. With children, we might include more informal practices like acts of kindness and doing crafts. All such things are absolutely important and play a key role in framing experiences and tying it all together. But there are times in our family life that may be even more crucial for faith formation but are never considered, falling into a “miscellaneous” category. If children learn more from observation than by being told something, they may be learning way more from the back seat than any time they come to church. The “back seat” doesn’t have to refer to time in the car but can be any time in the life of our families when we’re on autopilot, not thinking of practicing our faith in any way. The mundane, however, can be fertile ground for sacred opportunities. Before children can say or spell the word “grace,” they first learn it through how I respond to them and others. Before they ever know that “love your neighbor” is one of the greatest commandments, they hear how I talk about the people next door, and watch how I treat the ones across the street. Here’s the catch: we parents can’t just wake up one day and decide we’re going to set a better Christian example for our kids. We have to form our habits through prayerful practice and attentive repetition. This is perhaps the best way to think of what “discipleship” is all about. If I were to buckle up for the next car ride and think to myself, “I’m going to behave myself better today,” that would miss the point. The idea is to allow God to change me from the inside out and make me a person who, without even thinking, can treat that slow driver ahead of me with the same compassion and interest as a visitor to my church on Sunday morning. The exhortations we find in Deuteronomy 6 are pertinent here. God tells the people of Israel to “impress [these commandments] on your children. Talk about them when you sit at home and when you walk along the road, when you lie down and when you get up.” In other words, this stuff is about daily life. Comment on – and express thanks for – God’s creation. Be prayerfully curious about people in other cars: Where might they be going? What might be worrying them today? Engage visual cues, not with prejudicial assumptions but with thoughtful curiosity. Listen to lyrically rich music and discuss the meaning. During traffic jams or other inconveniences, have a contest to see who can come up with the most “At least we still…” statements (i.e., counting your blessings). Take note of a man-made structure and wonder out loud about how many people it took to build it, how long the builders might have worked and how tired they were afterward, etc. 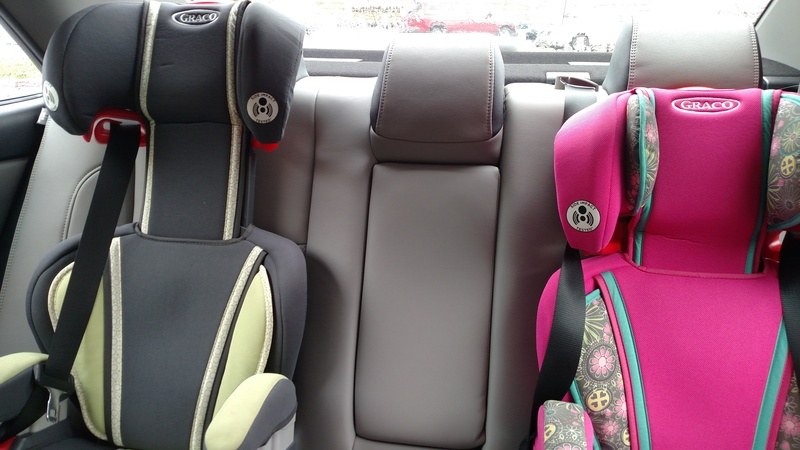 I’m hoping I get this right while the kids are still in the backseat, because before I know it, they’ll be in the driver’s seat – with me riding shotgun and wishing they had a 5-point harness for adults. Tags: driving, model, observation, practice, ways of learning. Bookmark the permalink.